Never mind that Firefox 3, the new browser, is so fast it runs circles around Internet Explorer 7 and Safari for the Mac (this after a long time of bloatware with Firefox 2), their website is the best I’ve ever seen at identifying exactly at getting people to download the browser. The navigation of the site has always been phenomenal (is there anything more straight forward than add-ins? ), and this release, it just gets better. Am I a Mac or a PC person? We’ll just look at the user agent provided by the browser and server, and we’ll detect the language and operating system. No choosing, just a small note that tells the user exactly who they are. This is a detail most websites completely miss (how many times do I have to see PC Software listed when I access Download.com?). 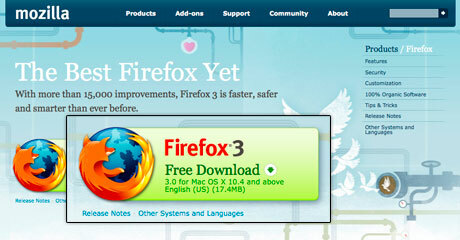 At the bottom of the page there’s content comparing Firefox vs. Safari, the native browser for the Mac I’m on. Brilliant! It’s free! And they tell you it’s free! Download now! Operators standing by! But what if I have the wrong language selected? I would have listed some of the languages here (how many Japanese people will be able to translate Other Systems and Languages if their browser is set wrong? ), but for the most part, selecting another platform or language is straight forward. The secondary page does it a great job listing the languages, but a poor job of translating the word “Download” into each language. Was someone, anyone paying attention?